Leading Manufacturer of bolt threading machine from Mumbai. 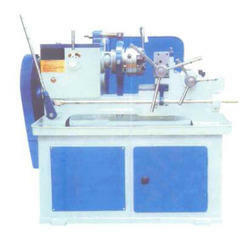 We are manufacturer and supplier of Bolt Threading Machine. We make use of optimum quality raw material and cutting-edge technology in compliance with international quality standards. Capacity 1/4" to 1" 3/8" total/2" 1/2" to 2. 1/2"
Length of Bed 44" 52" 72"
Length of Pedestal Box 44" 52" 22" x 22.20" x 16"
Width of Pedestal Box 18" 19" 21"
Height of Pedestal Box 20" 20"
Length of Slide 17' 18" 20"
Height of Slide 3" 3" 4"
Width of Head 11" 12" 23"
Height of Head 11.1/2" 12" 14.Y2"
Looking for Bolt Threading Machine ?